What is it that still frustrates us after five years? What can Americans expect to either self-import or do without when they decamp from the USofA to Occitanie? The least important category to consider when shopping for a prospective visit to an American living in France, NOT ANY MORE items might once have been essential fillers of unused checked baggage space, but no longer. We can get that stuff now. Why? Maybe supply and demand. Maybe karma. But Reese's Peanut Butter Cups are readily available in any number of stores. Even the white chocolate variety. So are ziplock bags that actually ziplock and garbage bags that you can lift up without having the bottom of the bags split and spill leftover lentils all over your blue suede shoes. Brown sugar, not cane sugar, is in the "See It, Buy Five' category along with panko and potstickers, but the new Asian Market in Beziers may prove a dependable supplier of the latter two. You guessed it. HACKABLES are hackable. Chocolate chips? Chop up chocolate. Jimmy Dean-style sausage patties for sausage gravy? The recipe (or a reasonable facsimile) is online and a trip to the butcher and to the pantry are all that's needed. SAVE 3 is not to be confused with the next category, SAVE 2: CLOSE but no cigar. CLOSE can never be confused with the real thing. HACKABLES are basically the real thing, just not packaged like the real thing. Need cornmeal? Polenta is boiled cornmeal. Grind down polenta and, while you haven't exactly unboiled it, it's still just cornmeal. So you want a Nathan's Hot Dog? They aren't sold here. Yeah, you can ship 'em, but you can ship anything. Assume that I'm not Jeff Bezos...before the divorce. Nathan's just aren't going to arrive in my mailbox. But there are all sorts of sausages, plain and smoked, that make for a near-dog experience. Of course, if you want a cheap, white bread, squishy bun to go with your dog-like sausage, FORGET IT (SAVE 1). 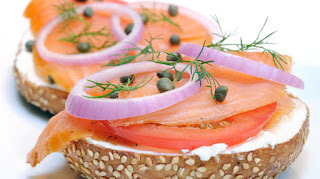 How about cream cheese and lox on a bagel? I can get you close but I can't take you all the way there. The smoked fish here is just fine. Salmon or trout. Rough and salty or slick and subtle? Your choice. Cream cheese? You can actually buy Philadelphia Cream Cheese readily, but it ain't Philadelphia Cream Cheese. The formula has been changed. They do that to us in Europe now and again. They add sugar or otherwise 'adjust' for some reason and you are left disappointed. Try St. Môret. Comes in a tub, spreads nicely, and tastes more like Philadelphia Cream Cheese than the box that says Philadelphia Cream Cheese on the shelf next to it. Bagels? FORGET IT. There are rumors that bagels are to be had in some of France's larger cities. I have not been provided with an example to study and therefore cannot confirm. When it comes to bread, though, the French provide a wide array of options. (But none in the style of Wonder Bread.) Buy a fresh baked loaf or roll from your local baker, hold your noise, and pretend that there's a hole in the middle and that you bought it at 6h00 at the bakery in Brooklyn. Golden syrup is not Karo syrup. It just isn't. And treacle isn't molasses. Garlic dill pickles out of the barrel? You can find jars of dill pickles, but they are not even CLOSE. There's no substitute for Hershey's Cocoa when you're baking a chocolate something, regardless of all of the great chocolate powders that sit on French shelves. Doughnuts are available, yes. But Krispy Kreme is in a category of its own and that category is not found in France. Gebhart's Chili Powder? Old Bay Seasoning? These are ingredients that you may be able to approximate, but the result would be different, not CLOSE at all. Did I mention squishy white bread? Right. I did. What's on your list? What do your family and friends pack in their luggage when they come for a visit? What do you wish that they would?